Say Hello to the Hippies! Seldom does the Upper Calder Valley look more beautiful than under a covering of glittering white snow. 1900: The new century got off to a shivery start when heavy snowfalls and blizzards caused chaos in the area; the storms were "unparalleled in the life of the present generation," reported the newspapers. Telegraph and telephone systems broke down and many towns were isolated as the railways ground to a halt. 1902: Temperatures in the first three weeks of May were the coldest for that month since 1841. 1912: In February the River Calder between Mytholmroyd and Sowerby froze. 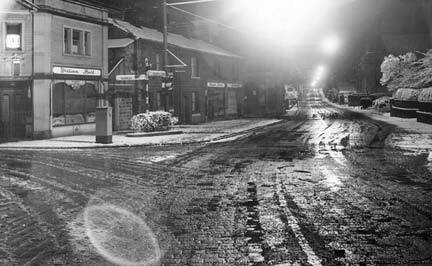 1919: Heavy snowstorms at the beginning of January caused "unprecedented havoc" in Todmorden. The town was virtually cut off. Elsewhere telegraph wires were brought down. 1923: Big snowstorms were reported in the area in February. 1925: Heavy snowstorms and blizzards made it a white Christmas lasting well into the New Year. 1926: For the second year running children celebrated as another white Christmas made it a season to remember. 1927: A particularly severe snowstorm was recorded on March 10. 1929: The meteorological station at Belle Vue, Halifax, registered 25.7 degrees of frost in February  the lowest temperature in 30 years. The Rochdale Canal from Brearley to Sowerby Bridge froze and as the big freeze continued into March the River Calder, together with most mill ponds and lakes, iced over too. A large gasometer at Redacre, Mytholmroyd, collapsed when frost caused some of the roof plates to buckle; fortunately no-one was injured in the subsequent gas blast. At Hebden Bridge Post Office mail had to be sorted by candle-light when the gas pipes froze. 1933: The heaviest snowfall for 40 years was recorded on February 4. Many roads were blocked and bus and tram services disrupted. 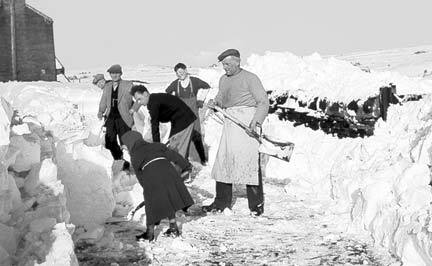 1947: The worst blizzards in living memory gripped the area and many hill-top villages were cut off from the outside world for nearly a fortnight. One of the worst hit was Blackshaw Head, where a convoy of horse-drawn sledges had to be used to get through to residents. The whole country was affected by arctic weather which lasted for two months. When the thaw came it was followed by extensive floods. 1950: Another white Christmas  the first for ten years. Which year set another record for freezing temperatures? And when did summer turn into winter? To find out, read the full story in Milltown Memories, issue 2. If this or other stories stirs a memory, we'd be happy to know - send us your memories and comments.